Rev. Christian Mondor often blessed the California waves during the ceremony called the Blessing of the Waves at the pier in Huntington Beach, California. Father Mondor was known to wear a wetsuit under his clerical robe. He was nicknamed the "Surfing Padre" by locals. Fr. Mondor died Wednesday, two days before his 93rd birthday. He had caught pneumonia. He was part of Saints Simon and Jude Catholic Church in Huntington Beach. There he heard confessions and sang in the choir for nearly three decades. The Rev. Ryan Thornton said, "The community was drawn to him because he had an extraordinary ability to connect with people." Fr. Mondor was a competitive swimmer since he was a boy, but only took up surfing in 1990, in his mid-60s. He gave blessings to surfers before they paddled out in the mornings. Father Mondor started a yearly interfaith prayer service on the sand with a rabbi and other religious leaders. This became known as the Blessing of the Waves and drew thousands of people. Father Mondor explained that the event was to honour St. Francis of Assisi, the patron saint of the environment. 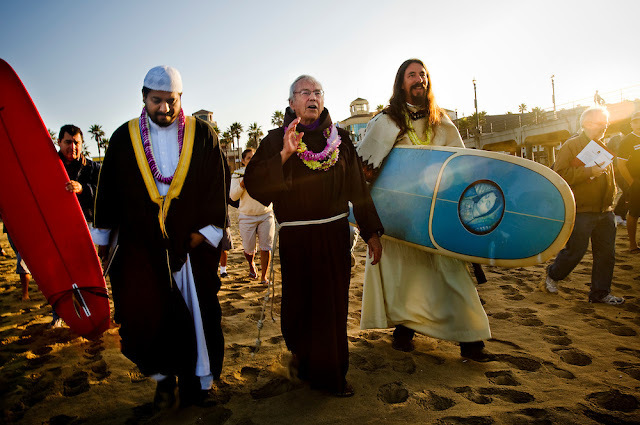 “We find that the ocean can bring people of all faiths together,” Father Mondor told the Associated Press in 2010. For about 70-years, Father Mondor worked as a priest and teacher across his home state of California, as well as in Oregon and Canada.